We had been using slackin for a while now to invite people to the Gophers Slack, and while it had been working okay, it had not been optimal. If you want to join us on Slack, visit the invite form to get invited! At the time I started writing this post the invite page was hosted on the Heroku free tier, mostly because I was lazy and there was a nice shiny “Deploy to Heroku”-button in the slackin README. For the amounts of traffic the website gets, this should not have been be a problem. But slackin is written in Node.js, and somehow it was regularily using 200% of the allowed RAM. I would get lots of emails warning me, and the app would get killed by the OOM-killer. This was a problem for us, because whenever the form stops working, people can’t get in, and we get emails from them and we end up inviting people manually. Which is exactly the reason why we wanted a invite form in the first place. Since I had wanted to rewrite everything in Go for a long time, I took this as an opportunity to do just that, and here we are! I spent some time earlier this year integrating ReCaptcha, so I was already semi-familiar with the slackin code base, and I had a good idea of what needed to be done, so I just started writing a backend in Go, figuring I’d steal the entire frontend and that bit would require minimal changes. It is not a complicated website. All we need is a form, and something that parses that form, and something to validate the recaptcha, and make calls to the Slack API. Go has everything we need. net/http is an excellent choice for making websites, and the built-in html/template will work fine for most projects, including this. 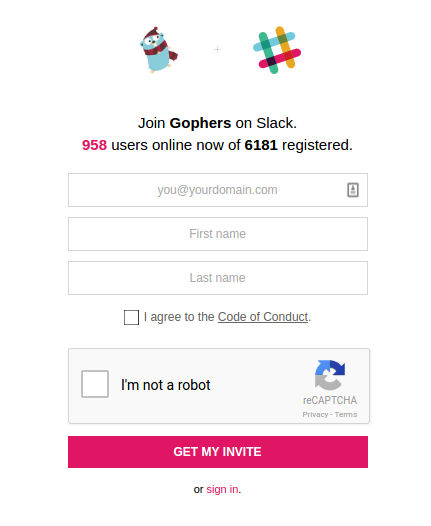 nlopes/slack is an excellent Slack client and go-recaptcha/recaptcha handles verifying the Recaptcha. This is a snippet taken from slackin that renders the invite form. We ended up with about 200 lines of Go code. To be fair, this does not replicate all of the features in slackin. I did not bother with the badges or websockets (for live user count updates), simply because we did not really use those. I saw that we did get a lot of traffic to the websocket URL when I deployed this new codebase, so it is possible someone has a badge for our Slack visible somewhere that is not working. As you can see, the Go version uses about 200MB less RAM. It’s a bit hard to see in the graph there without a scale. 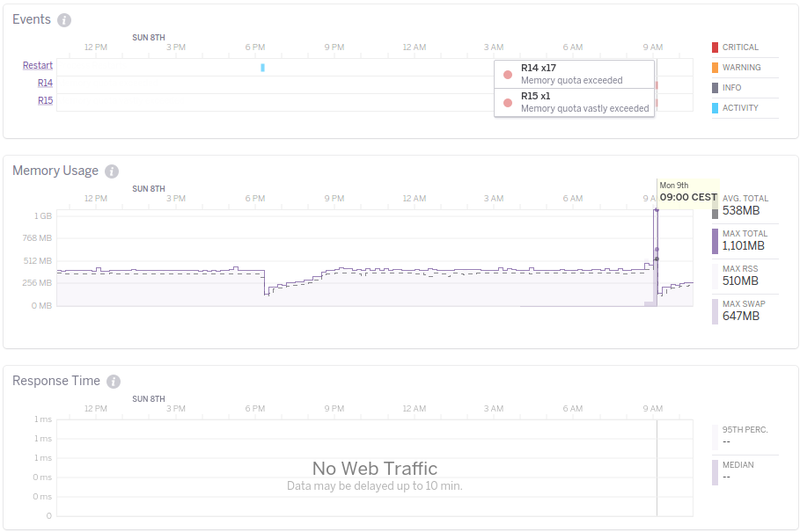 The only big question that remains is why the Node app was using so much memory. I gave it more memory and let it sit without any traffic for a few days, and it still managed to use up all the available memory. When I have time I am going to figure out why, but that will come as an update post later.